If you have lost your ability to work due to a physical and/or mental condition, you may be eligible for Social Security Disability benefits. An experienced lawyer can help to asses your situation and advise the best course of action. At PAVICK & PAVICK, L.P.A., we not only will fight hard to obtain the greatest benefit for you, but we also will ensure that along the way you feel encouraged, calm and educated that you know everything about your case. We invite you to contact us and tell us your story. Your initial consultation is free. To receive Social Security Disability benefits, you must be totally disabled from performing any kind of substantial gainful employment within your geographic region. You must have medical determinable physical or mental impairments, or a combination of such impairments which significantly affect your ability to work which do, in fact, prevent you from working for at least a period of 12 continuous months. To have a case, you first must have a disability which has already or is likely to keep you from working for at least one year. You must also have substantial work history before the disability and you must be incapable of performing any other employment outside of what you are accustomed to in your geographical area. Insured status requires at least 20 quarters of earning credits (ie., FICA taxes withheld) over the 40 quarters immediately preceding the filing of a Social Security disability application with the Social Security Administration. You are also eligible for Medicare coverage two years after being paid Social Security disability insurance benefits. For Further information visit: www.ssa.gov/disability/professionals/bluebook/AdultListings.htm This is not an exhaustive list. Many other conditions are covered if the disability is properly documented and satisfies the Social Security Law. Attorneys focusing in this area of law are experienced navigating through the Social Security system to help clients qualify for benefits. In hearings before an Administrative Law Judge (ALJ), we also develop the age, education and work experience evidence if you are unable to return to your past relevant work but still might be capable of performing light or sedentary work. If your Social Security claim is denied for your particular condition(s), you are not alone, and it doesn’t mean that you will not eventually qualify for benefits. The majority of claims are initially denied. At PAVICK & PAVICK, L.P.A., we will handle your case through all Appeal levels, if necessary, to try and win benefits for you. We will work to obtain the best available evidence and proof on your behalf and prepare you for any hearing before an Administrative Law Judge. There are appeal deadlines. Therefore, you want to contact an attorney as soon as you receive a denial decision from SSA. In certain cases, you may also qualify for Supplemental Security Income (SSI). The disability requirements are the same for SSI as for regular workers’ Social Security disability benefits. This is a federal income maintenance program for the aged, blind and disabled in all of the states. Monthly payments are paid to people who have limited income, if they are 65 or older, or if they are blind or have another disability. If you are not impoverished, you will never be eligible for SSI. Children with certain disabilities may also qualify. If you have been eligible for SSI cash payment for at least one month, you should also be eligible for Medicaid coverage. 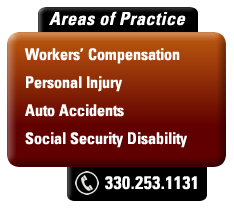 Our law firm generates many Social Security cases out of our Workers’ Compensation practice. We can help you in the coordination of the Workers’ Compensation and Social Security case, and help you pursue benefits in both cases. For a Workers’ Compensation injury, you do not have to be out of work and you do not have to be totally disabled. If you are disabled, we can assist with your Social Security claim at the initial claim or after your claim has been denied. We also help you with a denied disability claim which was turned down on Reconsideration. Some conditions are automatically covered, while others re	quire proof that your disability is severe enough to prevent you from working. We have the experience and resources to work with your doctors and healthcare providers to verify that your conditions amount to total disability under the Social Security guidelines.